Arkhangelsk is the center of Belomorie (the White Sea region), a nature reserve in northen Russia. The former name of the city is New Kholmogory. The present name was given to the city after the old Michael-Archangel Monastery. Before the Reforms of Peter the Great, Arkhangelsk was the only �sea gate� of Russia through which trade with Europe was conducted. Russian shipbuilding originated at the end of the 17th century. Exactly in this area Peter the Great founded the first Russian shipyard, started the construction of the first ship, and in a year-time personally participated in its launching. Many well-known expeditions of Russian travellers for the exploration of the North and discovery of new lands started from the port of Arkhangelsk. During World War II, the port of Arkhangelsk connected Russia with the Allied powers. Military hardware from Britain, Canada and the U. S. came to Russia via the northern waters of the Arctic Ocean. Currently, Arkhangelsk is a well developed industrial, scientific and cultural center. Its history, monuments, museums, theatres, new squares and avenues, old city buildings, a beautiful embankment and unforgettable white nights � make the city a real attraction for tourists. Astrakhan is located in the upper part of the Volga River delta. It is the center of the lower reaches of the Volga. The city appeared on the map in the early Middle Ages. It was the center of the Khazar, a feudal state in Eastem Europe. At the end of the 13th century the Mongol Khans founded the city of Astrakhan on the right bank of the Volga River. It became the center of the Golden Horde. The state was founded by Batiy, a grandson of Genghis Khan. Soon the city turned into a large trade center, but at the end of the 14th centure it was ruined completely by Tamerlane, a famous invader. In 1558, warriors of Ivan the Terrible founded a fortress here, thus opening a new era in the history of Astrakhan � the period of a border city. In the 17th century, it became the southern advanced post of the Russian state which played a significant role in its foundation and development. Here passed trade routes to the Crimea, Transcaucasia, Central Asia, Persia and India. The intermingling of historical destinies of the Russians, Tatars, Kazakhs, Nagais, Kalmyks and the Caucasian peoples is a characteristic feature of the city. The combination of Russian Orthodox Churches with Moslem Mosques, Persian and Armenian caravanserais with synagogues is typical of Astrakhan�s architecture. Currently, Astrakhan is a large port on the Volga River with a population of 0.5 million. Astrakhan offers many interesting excursions including to the Kremlin � a monument of architecture of the second half of the 16th centry � and a picture gallery featuring more than 3,000 pictures, drawigs and items of applied art. A green-house with a unique collection of tropical flora is located at the October cinema built by an Astrakhan merchant. The Astrakhan biosphere national park in the lower reaches of the Volga, where the great Russian river breaks up into 800 small rivers, is of a special interest. It is a real kingdom of over 260 species of birds. There is also a wide variety of animals such as boars, raccoons, musquashes, desmans, otters and beavers. In addition, there are spawning grounds of the local marketable fish and sturgeon migration ways. Ivanovo, one of the Golden Ring cities, is located on the bank of the great Russian river, Volga, 300 km north-east of Moscow. The first settlement was founded in the 16th century, where peasants were engaged in woodcarving, preparing dye-stuff and weaving flax linen. Flax weaving was the key trade. In 1742, Boutrimov, a serfman, opened the first linen mill here. Soon the village turned into the center of the country�s textile industry, the so-called �cotton empire.� Ivanovo cotton fabrics were in great demand not only all over Russia but also abroad � in Britain, Persia and other countries. In 1871, when the village of Ivanovo merged with Voznesensk Posad, it became known as the city of Ivanovo. Ivanovo played an important role not only in the economic but also in the political history of Russia: in its time the city was the largest center of the working class movement, where the first Council (Soviet) was formed. It served as a model of the country rule in the Soviet period. Wonderful architectural monuments such as the wooden Assumption Church and Shudrov Tent �an example of industrial structure � have been preserved until now. Palekh � 65 km from Ivanovo. Tourists can see the Church of Exalatation of the Cross; icon painting of the 14�19th centuries; Memorial Museum of Ivan Golikov, the founder of Modern Palekh lacquer painting; exhibits of the Museum of Lacquer Miniatures. is the capital of Eastern Siberia. Irkutsk was founded as a small settlement by Russian Cossacks. It was a wooden fortress on the banks of the Angara-river, where the Irkut � its tributaryflows into its waters. Soon it got the status of the city. During its 300 years history it has witnessed many wonderful events. Today Irkutsk is a modern city with a population of 600 000 people. Traditionally Irkutsk has been the country�s main producer of furs. Siberian furs are of great demand at international fur auctions. The central part of the city is an outstanding architectural ensemble in the Russian classical style. Your aim will be the Lake Baikal (65 km), one of the most beautiful and deepest lakes in the world. The size of the lake is impressive: 636 km long, 31,5 thousand sq. km, 1620 m deep. The water in the Lake Baikal is unusually transparent and cold. The excursion to the Lake Baikal is unforgettable. is situated on the Amur river. The city was founded in 1858 as a military fortress. Today Khabarovsk is a modern city, a scientific, cultural and industrial centre of the Far East. Its population is about 600 000 people. From the cliff you can enjoy the beauty of the Amur-river, having its source in Mongolia. The length of it is about 4000 km, the width in summer is up to 3-4 km. The flora and fauna of the region are unique. You�ll be surprised to see a fir-tree entwined with grapes and manchurian nut-tree, growing close to a cedar and a fir. The Amur river abounds in fish. Only here you can see a tzar-fish-kaluga. offers an opportunity to stay in the 19th cent. town. This is a town on the Volga with an unusual fan-shaped layout, designed by very talented architects. There are no houses alike in Kostroma. The town was founded in 1153 by Prince Yuri Dolgoruky, that�s why Kostroma is called Moscow�s �blood sister�. The pearl of Kostroma is the ensemble of the Ipatiev Monastery. The central part of the town is an outstanding architectural ensemble built in the Russian classical style: the market rows, the fire tower, the watchtower and the official buildings. The so-called old town is the oldest part of the monastery (15th cent. 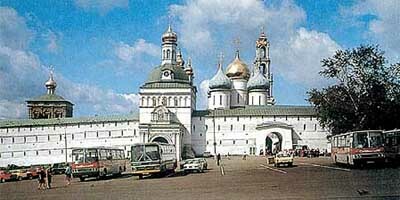 ).The monastery�s pride is the five-cupols Trinity Cathedral. In 1613 an emissary of the Zemskii Assembly came from Moscow to announce to Mikhail Romanov (he was the first of the new dynasty of Russian tzars), that he had been elected a tzar. Rare books are kept in the monastery, among them the famous Ipatiev Chronicle, a real encyclopaedia of Ancient Rus. Out-of-town-tours: Pless; Nerekhta; Krasnoe-on-the-Volga village. is the largest Siberian port on the Yenissey River. The history of the city, founded by the first Russian explorers, dates back to more 300 years. The city�s spectacular growth is largely due to the Trans-Siberian railway and the construction of the bridge across the Yenissey Krasnoyarsk was founded in 1628. It was a fortress built on the high Krasny Yar overlooking the Enissei river. Thanks to the fertile land the city was soon settled by Russian explorers sent here from the European part of Russia in the middle of the 18th century. The second largest hydro-electric power station (after Sayano-Shushensk) is at Krasnoyarsk. Nizhni Novgorod, 400 km east of Moscow, lies at the confluence of the Volga and Oka rivers. The town was founded in 1219-1222 as outpost of the Russian principalities in the struggle against external enemies. The nature of Nizhni Novgorod Region is various: in the north its area is covered with dense Kerzhensky forests, where, up to now, brown bears, wolverines, elks and other animals can be found. It was here, in the Kerzhinsky forests, that quite a few villages and small and secluded monasterits, inhabited by old believers since the 17th century, have been preserved to this day. In the south the steppe extends over a wide area. The Volga divides the area below Nizhni Novgorod into two almost equal districts, which are known since old times as �in the forest� and �in the mountains�. At the end of last century Nizhni Novgorod was a major commercial centre of Russia, and the Makaryevsky Fair, which was held there, was one of the most significant in Europe. All the architecture of the center of the town corresponds to the Russian merchants� way of living. Visiting Nizhni Novgorod by foreigners besame available only in the post-Soviet period because of a great number of �classified units� located here. The Art Museum of the town is called a �miniature Tretyakow Gallery�: its collection of pictures by Russian artists of different periods is one of the best in Russia. Nizhni Novgorod Region has always been renowned for its crafts � Khokhloms and Gorodets painting on wood, Balakhna lace and Pavlovo filigree. In the forests behind the Volga, at the Svetloyar Lake, there is one of the most mysterious places in Russia. As a legend says, at one time there stood the town of Kitezh, which disappeared in a flash but did not surrender to the Tatar conquerors. The local citizens say that when the weather is clear and calm, one can see the reflection of the town in the lake and hear the quiet ringing of the church bells. Though Novgorod means �a new city� in Russian, it is one of the oldest Russian cities. It was founded in 859 on the bank of the Volkhov River and for a long time was the capital of the rich and influential Novgorod Republic. Novgorod appeared at the crossroads of a number of imponant routes and soon turned into the leading trade center of feudal Russia. Novgorod became famous for the freethinking and independence of its citzens. Only as a result of the military campaigns of Tzar Ivan III in the 15th century the city was joined to the Russian state. Many architectural monuments were built in the 11�17th centuries including over forty ancient churches, magnificent museums of history and culture which make contemporary Novgorod a city-museum, an architectural preserve. Novgorod�s environs are also very interesting. The great Russian writer Fyodor Dostoevsky lived for a long time in the of Staraya Russa which was described in his novel, The Karamazov Brothers. The picturesque environs of one the most ancient monasteries in Russia � the Yuriev Monastery � have inspired many Russian artists. Vitoslavitsy � a museum of wooden architecture � features ancient churches (built in the 15�16th centuries) and peasant�s structures from the nearby villages. Near Novgorod, archeologists have found many written monuments of ancient Russian culture-birchbark letters and well-preserved remains of ancient structures, wooden pavements and different objects of everyday life. The appearance of the city on the map of Russia is connected with the construction of the railway bridge over the Ob river for the Trans-Siberian railway. In was founded in 1893. This is the only city in the world where the population has reached 1,5 mln within 70 years. So, as for its area, it is the third city in Russia after Moscow and St. Petersburg. Today Novosibirsk is one of Russia�s main scientific centres. The Siberian Branch of the Academy of Sciences of Russia is located here, as well as research institutes of Western and Eastern Siberia and the Far East, the Siberian Branch of the Academy of Medicine. Although Omsk is a major industrial city of Siberia, it is very picturesque and comfortable. The city extends over 40 km along the banks of the Irtysh river. The city was named after the Om river, which means �quiet�. Its origin is connected with Russian Cossacks who founded a fortress at the confluence of the Om and the Irtysh in 1716. At the end of the 19th cent., the Trans-Siberian Railway was built, which connected Omsk with the European part of Russia. Omsk served as a place of exile for adversaries of tzarist regime. The life of the great Russian writer Fyodor Dostoevsky is closely bound with the city. He spent 4 years in jail and described that period in his famous �Notes from a Dead House�. Orenburg was founded in 1743. Today Orenburg is a city with a population of 500,000. It is situated in the Southern part of the Ural mountains. Orenburg is a major industrial center of Russia, with 90 enterprises, including those of gas industry. Crafts made by local masters � down headscarves, as thin as a spider�s web so that they can be hidden in a goose-egg shell and pulled through a wedding ring � are famous all over the world. In Orenburg there is Russia�s oldest higher military-aviation school, where the first man in space Yuri Gagarin studied. One can see the plane he flew near its entrance. The history of Orenburg cover three centuries. The exploration of this place started in the 18th century and the center of a huge gubernia (region) was founded in 1743. The life was quiet and peaceful here up to 1773, when the gubernia, as well as the whole of Russia suffiered the severe peasant war headed by Yemelian Pugachev. In the 19th century, the city was growing into a military and bureaucratic center. In the autumn of 1833, it was visited by Alecxander Pushkin, who afterwards wrote a novel, The Captain�s Daughter, and The History of Pugachev. In the city�s central street one can see buildings which are historical and architectural monuments. Here is the famous Rychkov�s house that once belonged to the explorer of the area. His wife was interested in local down scarves production and presented them in the Free Economic Society. She was awarded a gold medal for that. Since then the down headscarves became famous. Also you will hear about Orenburg Cossacks. Today Orenburg is a center of gas industry and down scarves craft. During the tour you will visit the Local History Museum. The capital of Karelia lies on the shore of the Onega Lake, 300 km north-east of St.Petersburg. Peter the Great gave rise to the city by building a gun factory there in 1703. In 1777 Petrozavodsk gained the status of the city. Its first Governor was the outstanding Russian post Gavrjil Derzhavin. The natural preserve, Kivach, is located not far from Petrozavodsk. There are more than fifty waterfalls on the River which is called �the mother of waterfalls�. There is also the first Russian health resort, Murtisialny Vody, near Petrozavodsk, founded by Peter the Great. The island of Kizhi, a one hour drive from the city, is a unique open-air museum of Russian wooden architecture. �The eighth wonder of the world� � the Intercession Cathedral of the 17th century � was built of wood with not a single nail. The structure astounds with its height and a great number of domes. Civil structures and temples created by northern architects in the 14th century, are also of great interst. The old Russian city of Pskov has not withered in the course of time. Its special serenity is typical of a provincial Russian town. The Kremlin of the city reflects its glorious past. Pskov was first mentioned in Russian chronicles in 903. From the 12th to the mid-17th centuries this strongly fortified city-state stood guard over Russian lands in the north-west. On April 5, 1242 Prince Alexander Nevsky routed the German knights on the ice of the Chudskoye Lake. This battle went down in history as the Ice Battle. The armies of the Polish king, Stephen Bathory, and the Swedish warrior-king, Gustav Adolphus, were defated at the approaches to the city. In the Middle Ages, Pskov like Novgorod was a feudal republic which did not want to submit to Moscow for a long time. In 1721 the war with Sweden ended. The Russian border was moved far to the west. And the city lost its military value. Tourist are attracted to Pskov by its ancient architecturat monuments. There are more than 100 of them in city. Among them are the Pskov Kremlin with the Trinity Cathedral (built in the 17th century) and Mirozhsky Monastery (12th century) which is famous for its frescoes. Other attractions include 17th century merchants� houses, small churches and monasteries which are especially charming. Pskov and its environs are closely connected with the name of the great Russian poet Alexander Pushkin. Mikhailovskoye, Pushkin�s family estate, is located not far from Pskov. Trigorskoye (�trigory� means �three hills� in Russian) is half-way from Mikhailovskoy. It belonged to Praskovya Osipova-Wolf. During his exile Pushkin often visited her family. And his wonderful verses were dedicated to them. Pushkin loved the beauty of the landscape which was a real inspiration for his works. And it was in the cemetery of Svyatogorsky Monastery that Pushkin was buried on February 6, 1837. The famous Russian composers Modest Mussorgsky and Nikolai Rimsky-Korsakov lived near Pskov at the end of the 19th century. Rostov the Great is one most interesting cities of the Golden Ring of Russia. �A miracle� from the past, �a symphony in stone�, �an eternal city of Russia� � such poetic names are given to this ancient Russian city by its visitors. At the end of the first millennium Rostov was a flourishing, densely populated city, an important center of Russian statehood. The fame of the city grew whith the construction of the Kremlin in the 17th century on the shore of the Nero Lake. Currently, the city takes pride in architectural monuments and items of monumental icon painting. The famous Rostov bell ringing was revived recently; for the harmony and fascinating sounds Rostov bells are called �red� (or �beautiful�). Amazing sounds of Rostov bell-tolling can be heard for miles and miles around. Sergiev Possad, one of the most interesting old towns of Central Russia, is situated 58 kilometres from Noskow. The town was founded in the 14th century as a settlement around the Trinity Monastery. The founder of the monastery was the Saint Sergy Radonezhsky canonized by the Russian Orthodox Church. The Trinity Sergiev Monastery was one of the largest monasteries founded in Russia in the 14�15th centuries. 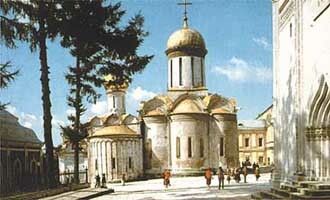 In 1774, the monastery was given the title Lavra, i. e. the monastery of the highest rank. 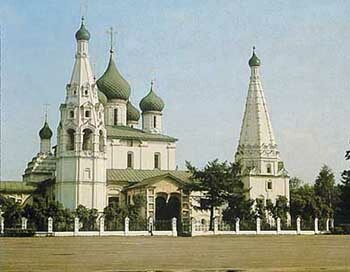 The Trinity Sergiev Monastery played an important role in the history of the formation of the centralized Russian state and in the development of the Russian culture. Due to its wealth, the monastery could afford to invite the best architects ans icon-painters for the construction and decoration of the buildings. The monastery bought and was given as gifts a lot of first class objects of art and crafts. The best of these now form the collection of the Museum which is located on the grounds of the monastery. The architectural ensemble of the Trinity Sergiev Monastery was accomplished by the end of the 18th century. The oldest structure of the monastery is the Trinity Cathedral built in 1422 to 1423 and painted by the Russian icon painters of genius Andrei Rublev and Daniel Chorny. The Assumption Cathedral (1558-1585) which resembles the Assumption Cathedral of the Moscow Kremlin is the center of the ensemble of the monastery. 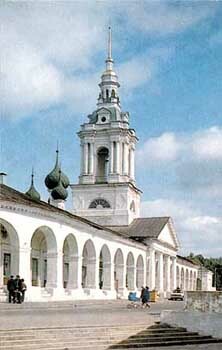 On the grounds of the Trinity Sergiev Monastery there is a museum which was founded in 1920. The exposition of the museum consists of ancient Russian art of the 14-17th centuries, embroidery, gold and silver works and masterpieces of ancient icon painting. 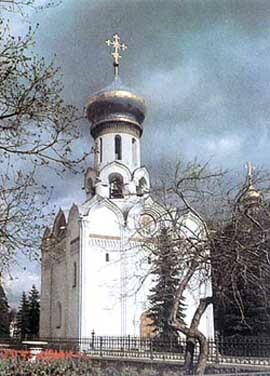 In the Soviet time, the monastery was the official residence of the Patriarch of All Russia. is a town-museum. It was awarded the Golden Apple prize by UNESCO for the preservation of its unique architectural ensemble and tourist development. Suzdal�s beautiful monasteries and churches attract tourists from all over the world. A special charm of Suzdal comes from its numerous architectural and historical monuments created in the span of many centuries. The ancient architectural ensemble of Suzdal is extremely picturesque. The town of Suzdal started with the Kremlin. Nowadays it houses an outstanding museum of icons. 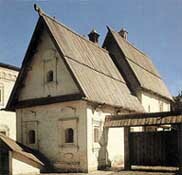 Suzdal emerged as a trade and artisan centre at the beginning of the 11th cent. After the capture of Kiev by the Lithuanians in the 13th century it became the religious centre of Mediaeval Rus. You�ll enjoy the monasteries of Suzdal (5), numerous churches dating from the 13th cent. In the Museum of Wooden Architecture, which is on the right bank of the Kamenka river, you can enjoy the beauty of traditional Russian architecture, learn about Russian history, culture and the life-style centuries ago. The history of the city of Tula has its origin from the depths of unrecorded time in the Vyaticht tribes, who settled in the basin of the upper and middle Oka. The first mention of the tows was made in the 12th centry. After 1380, when in the great battle on the Kulikovo Field, 130 km south-east of Tula, the army of the Moscow prince Dmitry defeated utterly the tatar army of the Golden Horde, the town formed a part of the united Russian state. Its fate was defined by history itself to be the shield of Russia, to defend the capital from the south. By the middle of the 17th centure Tula was gradually becoming a more and more well-known center of crafts and commerce. The town was getting clothed in stone, life was becoming more brisk. At the of the 16th century the first settlement, inhabited by blacksmiths, sprang up here, which gave the town of Tula a new reputation of a weapons maker, the armory of Russia. In 1712, by the order of Emperor Peter the Great the Tula gun factory, the oldest one in Russia, was built, which has not lost its significance until now. The coat of arms of Tula, originated in the 18th centry, also reflects its craft � the art of weapons makers. is the capital of the Buryat Autonomous Republic of the Russian Federation. In is located at the foot of the mountains, at the confluence of two rivers, the Uda and the Selenga (75 km from the Lake Baikal). The population of Ulan-Ude is about 350 000 people. Ulan-Ude is almost 3 centuries old. Due to its advantageous geographical position the city grew rapidly and became a big trade centre which connected Russia with Mongolia. The city�s economic development is largely due to the construction of the Trans-Siberian Railway (1899). There are a lot of historical and cultural monuments in Ulan-Ude, the settlements of ancient people, dating back to the 2-1 cent. B. C. In the 18th cent. Buryatia became the part of rhe Russian Empire. Ulan-Ude is one of centres of Thibetan medicine. It was officialy recognized as the Russian centre of Buddhism in the middle of the 18th cent. by Empress Elizabeth. Nowadays threre are 20 Buddhist temples in Buryatia. The most beautiful one is the Ivolga datsan � 40 km from Ulan-Ude. is one of the oldest cities. It is a part of Russia�s Golden Ring tour. The northeastern part of ancient Rus is rich in historical and cultural monuments. In the second half of the 12th century it was the capital of Vladimir-Suzdal principality. The town developed, grew stronger, trade and crafts flourished. It played an important role in the formation of the Russian centralised state. 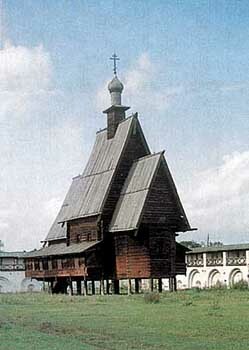 Among the oldest buildings in Vladimir are the Cathedral of the Assuption (early 12th cent.) decorated by Andrei Rublyov, the Cathedral of St. Dmitrii (12th cent. 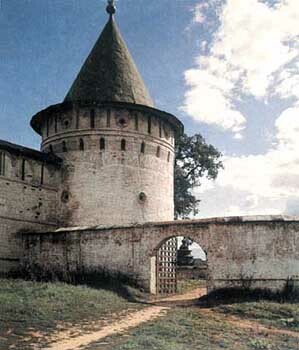 ), the church attended by Prince Vsevolod III, and finally the famous Golden Gates (12th cent. ), one of the few survived defensive structures of ancient Rus. The wonderful monument of ancient Russian architecture of Vladimir and Suzdal will leave you with memories that will last for ever and will bring you closer to the culture and history of Russia. occupies a special place among the country�s cites. It is situated on the Muravyov-Amur peninsula. It is washed by the waters of the Amur and Ussuri Straits. There are several bays suitable for sailing, one of which, the Golden Horn, is closely linked to the history of the city. It was founded in 1860 when the Russian warship Manchur anchored in the bay of the Golden Horn of the Amur Gulf. A maritime strong point was laid on the northern side of the bay. Soon it was given the status of the city. On the 1st of June 1891 the construction of the railway line between Vladivostok and Khabarovsk was started as a part of the Trans-Siberian. Today Vladivostok is the country�s largest Pacific sea port, the city with the population of 700 000. The life of the city is closely linked to the sea. In 1992 the city was opened for foreign tourists. is one of the oldest Russian cities. It was founded in 1010 by Prince Yaroslav the Wise. Yaroslavl is situated at the spot where the Kotorosl river inflows into the Volga. Yaroslavl emerged as a fortress which controlled the Volga trading route. Yaroslavl is famous for its remarkable architectural monuments. Not by chance they call it �Russian Florence�. 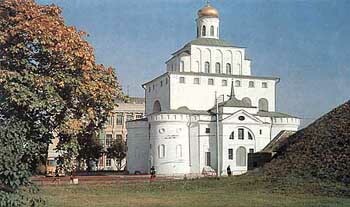 The first stone buildings were constructed in Yaroslavl in the 13th ctnt. The oldest architectural monument goes back to the first half of the 16th cent. Among the monuments of that time of note are: the Cathedral of Transfiguration of the Savior, the belfry, the refectory, the church of Nativity. The 17th cent. in the history of the city is known as �a golden age�. At that time the so-called Yaroslavl school of architecture was formed: a mixture of Moscow school of stone architecture and traditions of northern wooden architecture. 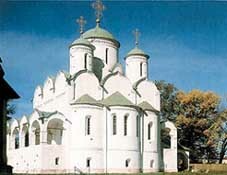 The pearl of Yaroslavl�s architecture is the church of Elijah the Prophet (1647-1650). Yaroslavl is the home of the first Russian professional theatre. The city�s proud is the embankment. It took shape in the first half of the 19th cent. Yaroslavl is a birthplace of many outstanding people. Out of 19 towns of the Sakhalin Island Yuzhno-Sakhalinsk is the largest one. The town was founded in 1882 as a small settlement by Russian Cossacks. In 1905 the southern park of the island passed to Japan. They called the town Tajohara, which �fertile soiles�. Since 1947 Yuzhno-Sakhalinsk has been the main town of the Sakhalin region. It includes 59 islands and the Kuril Islandes. The largest one is Sakhalin. The population of the town is about 170 000. Today Yuzhno-Sakhalinsk is a modern town, situated in the picturesque valley. There is the oldest railway for children in the country (built 30 years ago), the Drama theatre, the Puppet theatre, the Arts Museum, the museum of local history. The town of Kholmsk is of great interest for tourists. The road to Kholmsk is very picturesque. It runs through the Kamyshovskii range, bridges over canyons, numerous tunnels, the Devil bridge, which crosses the railway at high altitude, passes small rivers and waterfalls. It is possible to organise an excursion to the Kuril Islands, the mountain chain, having 40 active and many extinct volcanoes. The Kuril Islands are situated from the southwest to the north-east (from Hokkaido to the Kamchyatka peninsula). The big Kuril Range is 1200 km long, it consists of 30 islands. The small Kuril Range is 105 km. It has 6 islands. Out of 6 islands the largest one is Shikotan. �Shikotan� means �the best place�. The island is overgrown with forest and lianas. There is an active volcano (Mendeleev) and many hot mineral springs on the Kunashir island. The Kuril Islads are famous for numerous lakes. You�ll be impressed by the beauty of the mountain lake on the Onekotan Island, the boiling lake Ponto on the Kunashir Island and picturesque waterfalls.